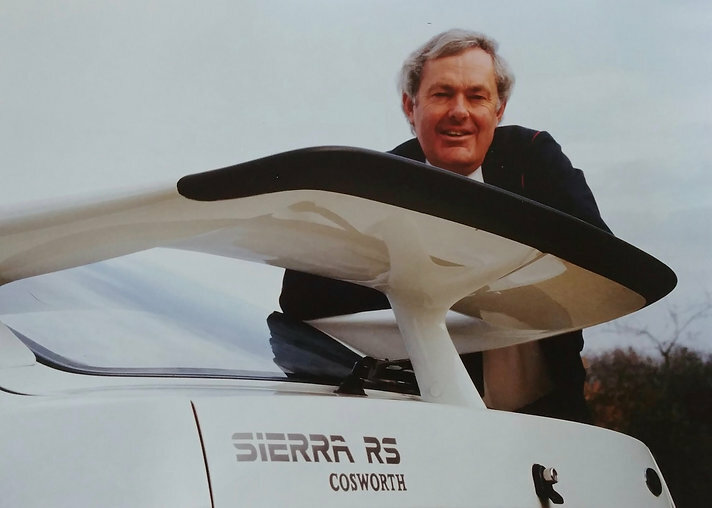 Rod Mansfield’s team created the legendary Sierra Cosworth, Capris Injection and XR4x4. I'm talking to him on Tuesday. He’s writing a piece for my new second book about what it was like to engineer the RS Capris and Capri Injection. What questions have you got for him – let me know! And if I know the answer from previous discussions I'll try answering here. 1. I had read that the '89 XR4Ti was supposed to have, essentially, the Turbo Coupe's intercooler, breathing through a hood scoop, which was why they moved the fill jug to the driver's side, among other cooling system modifications which came to light for the '89's. 2. Any plans for rear discs, maybe the Scorpio/Sierra antilock braking system? When Ford delivered a tester car to an automotive magazine how did they go about preparing the vehicle? I have read that it was common to send in a ringer back in those days, and these test vehicles seem to be slightly quicker than vehicles tested at a later date. Did they run a completely different tune, such as the fuel and ignition maps from a Mustang SVO? This would have needed to be adjusted for the XR4TI's small air meter somehow. Did a special engine exist that was balanced and blueprinted or possibly a different turbocharger? Maybe a Ford tech just advanced the timing a little or changed the wastegate actuator to allow a tad more boost. It didn't take a whole lot to push the Merkur out in front of it's competitors. And dropping in a limited slip rear differential would have also been tempting. Unfortunately, Rod won't know the answer to that one I'm afraid. He was in the UK at the time running SVE and so would have had little insight into what was being done stateside. In the UK, where he and I were based they didn't really indulge in blueprinted special engines. That's simply because the press launch cars were always hurridly taken off the line, checked over for things like suspension and fluids and then (because of deadlines) send out on test ASAP. I'll ask him though about later SVE/SVO days, but they would have come after Merkur when he worked in the US. I've read that the XR4Ti launch cars had blueprinted engines, it's possible but I'd err against. Unlike some, Ford isn't really into cheating this way as a corporate entity. That's not to say it didn't happen on XR4Ti but Rod won't definitively know the answer. As we all know the world of pub stories tends to create many myths and sometimes it's easier to believe what seems appealing. I read once that "Ford found an extra 500 bodyshells" and doubled the number of run-out Capris. Lovely idea but no, a body will rust after 36 hours and needs scrapping as they can't be painted and their value negligible, plus they take up a lot of space! When I worked at Jaguar I was told of a "hot engine" that lived on for years that just overdelivered on power. It was swapped in and out of numerous press cars and nobody knew. So it's possible. But if I were a betting man I'd say not high odds. 1: TBH I doubt it - the XR4Ti was out of Rod and my remit as (quite correctly) NAAO, North American Automotive Ops would commission engineering changes for mechanical components and EAO undertake them. So in plain English that meant engine engineering on Lima was NAAO and everything else was EAO. So (being UK based) all I ever saw in the timing plan was the installation of the 2.9 EFI in XR4Ti to match with Scorpio. We engineered Scorpio as I recall in totality for body and engine whereas XR4Ti was more of a Frankenstein. EAO had zero interest in XR4Ti (naturally given what was happening with XR4i) and so we wanted to make any work we did on it be as close EU XR4i as poss. Understandably Dearborn wanted the cheap Lima unit and was persuaded that the 2.9 V6 would be OK - but it wasn't a great motor and so I suspect they killed it and stuck with Lima. So, unfortunately, something you'd have to ask NAAO product planning. We did a twin turbo V6 that we wanted for XR4i and NAAO to take in Explorer but it went nowhere. Especially when Cosworth YB was mooted and we didn't need two 200bhp units. 2: Yes, see above - the plan was to shift all of Sierra over to ABS at the 87 facelift and I assume Merkur XR4Ti would have got it then. But NAAO evidently left the car suspended in time with the 83 shell and never got around to requesting EAO to calibrate and homologate the ABS set up. Fascinating, thank you. Too bad about the twin-turbo V6-- that would have rocked! I can't recall where I saw at least a mockup/prototype XR4Ti with a TCIC and a hood scoop, but I'm pretty sure I did. If you're interested I'll post photos of the Sierra twin-turbo. I've seen others as well. I actually hadn't seen this one before. Cool!